Along the same lines as my proposed TV show Name That Ancestor, I have a book idea. It’s a take off of the children’s book Are You My Mother? In this time machine fantasy series, we could go back to the date a picture in our collection was taken and ask each of the subjects, are you my ancestor? There are very few people in this picture I can name. 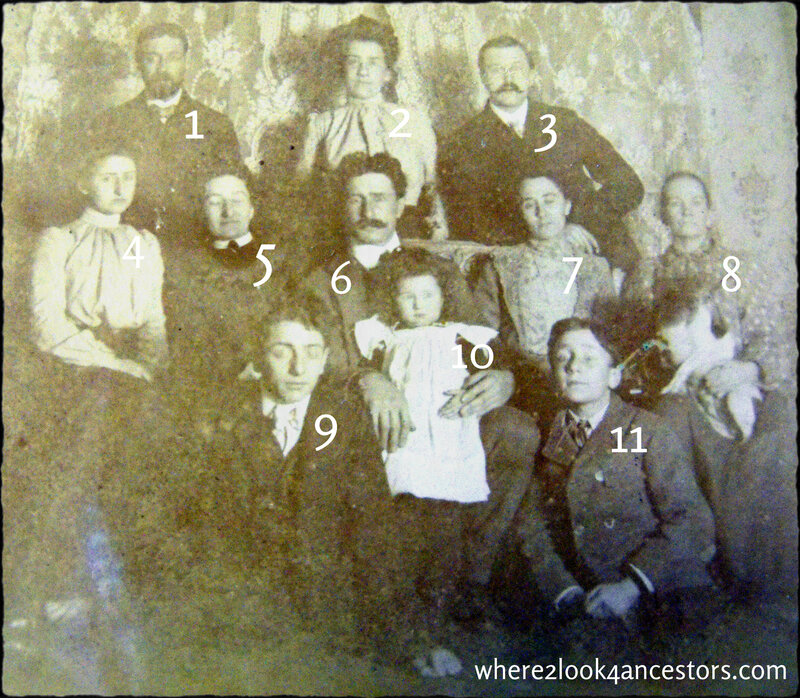 The unknowns in this group shot might include my direct-line ancestors. Oh how I would love to know! Otto V. MUELLER [Born Sep 1868. Died 16 Apr 1912.] My 2nd great-grandmother’s son. I’ve written about Otto here and here. Alma E McBANE (nee MUELLER). [Born 14 Sep 1882. Died 10 Jun 1967.] Otto’s half-sister, the daughter of Elise (nee SCHMITT) and Jacob K. MUELLER. Alma looks younger in this picture than in this one, don’t you think? Alvina M MUELLER (nee SCHMITT) [Born 15 Dec 1883. Died 12 Oct 1972.] Married Otto V MUELLER (#1) 23 Jul 1902 in St. Joseph Michigan, one of the reasons for my recent genealogy road trip. Alvina looks younger in this picture than she does in this one. Unknown – Who is this woman? She appears in another photo with [Alfred?] and her dog. I really want to name as many of the people in this and that photograph as possible. How would you begin? Do either Alma or Alvina have children who are still alive? Maybe they would know? If only they did! Alma married late in life and had no children. Alvina and Otto had one daughter; this is the line from which cousin Sandy descends. Sandy has asked the relatives who might be able to identify the people in the picture, but so far no one has been able to do so. I’m hoping someone who descends from one of the unidentified people in either picture will find my blog and fill in some blanks. The search continues! I have a number of these “mystery photos” also. A professional photo-genealogist helped me narrow down some, but without multiple photos of the same people or a clue, I don’t think even she could help. I hope someone find the photos and helps you! Thanks Amy! I’m determined to solve these mysteries and I appreciate all the help I can get! If you want the name of the person I hired, let me know. It was expensive, but she did a great job.